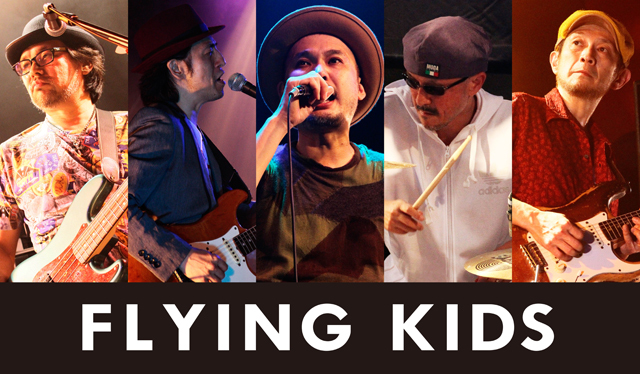 FLYING KIDS formed in 1988. They entered a band audition program called “HEISEI MEIBUTSU IKASU Band TENGOKU” and became the 3rd IKATEN Kings. They went on to win five weeks to become the first Grand Kings. They were then suddenly thrown into the limelight. FLYING KIDS made major debut with the single, “SHIAWASEDE ARUYONI”. In earlier years, the band was heavily into funk music and influenced many musicians. In later years, they put out smash hits such as “KAZE NO FUKINUKERU BASHO E”, “TOMODOI NO TOKI WO KOETE’, “KURAYAMI DE Kiss ~Kiss in the darkness~”, and “Discovery” and became the center of the J-POP scene. The band broke up in 1998. In 2007, the six original members of FLYING KIDS reunited. Since then, they have put out an original album, held “one-man” shows, and appeared in summer festivals. Keyboardist Tatsuhiko Iino left the band in 2014.